Hundreds of Men followed Colonel Benedict Arnold northward on his famous expedition to capture Quebec in late December 1775. They joined with General Richard Montgomery, but after Montgomery was killed by enemy fire, his men retreated. Arnold&#x2019;s troops, however, continued fighting after Arnold fell wounded and only surrendered when hopelessly outnumbered and trapped inside the city. Who were these men and what became of them? Arthur Lefkowitz answers these questions in his fresh and compelling Benedict Arnold in the Company of Heroes.<br /><br />An award-winning writer on the American Revolution, Lefkowitz spent years searching through archival materials to paint splendid and compelling portraits of Arnold&#x2019;s amazing cast of veterans whose fates offer a fascinating glimpse into the lives of early American patriots. His original monograph begins with an overview of the failed Canadian invasion before following these men into prison (where some devised intricate plots to break out and even seize weapons to capture the city). Despite their hardships, many returned to the rebel army to continue their fight for independence.<br /><br />Arnold&#x2019;s men, explained George Washington, were worthy of particular notice and they never disappointed him. Some of those portrayed in detail include Charles Porterfield (who led troops at Brandywine); Daniel Morgan (the hero of Cowpens); Henry Dearborn and Timothy Bigelow (who fought alongside their old commander at Saratoga); Christian Febiger and Return Jonathan Meigs (who were at the forefront of the attack on Stony Point); Simeon Thayer (who refused to surrender Fort Mifflin); and Colonel Aaron Burr (whose impressive wartime record was marred by his tumultuous political career). What accounts for the inspired leadership of so many veterans from Arnold&#x2019;s expedition? Lefkowitz presents a compelling argument that they learned by example from Benedict Arnold, himself a courageous and charismatic officer.<br /><br />Original, fast-paced, and deeply researched, Benedict Arnold in the Company of Heroes is essential reading for everyone interested in our endlessly fascinating American Revolution. 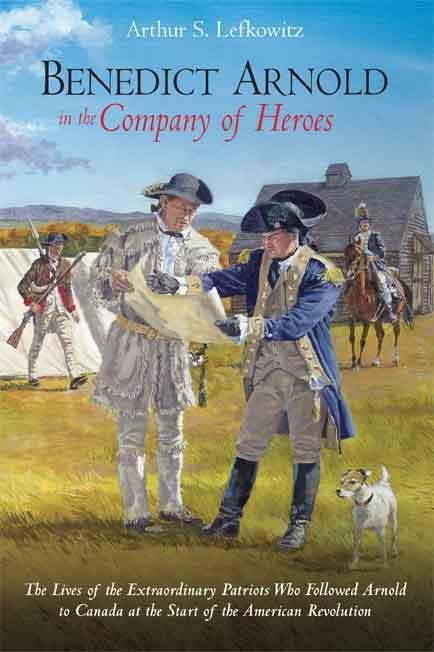 Arthur S. Lefkowitz is an award-winning writer on the American Revolution. He lives in central New Jersey. Savas Beatie LLC is an El Dorado Hills-based book publishing company established in 2004. The company has published more than 100 military, general history, and sports history titles, many of which have won awards and been selected by national book clubs. Address: El Dorado Hills, CA, U.S.A.